We started our journey on N55 Indus Highway from its zero point at Jamshoro (N55-Part I)and covered 384 kilometers to reach the city of Shikarpur (N55-Part I). Today we’ll continue our journey on the right bank of Indus and will drive 333 kilometers more to reach Dera Ghazi Khan. We’ll pick up our journey just north west of Shikarpur. So lets rev up your engines and come with us. A small town located on N55 at Km marker 427. The whole town is located on the south side of the highway where as north side of highway is without much hutments. Mostly comprises of green fields. 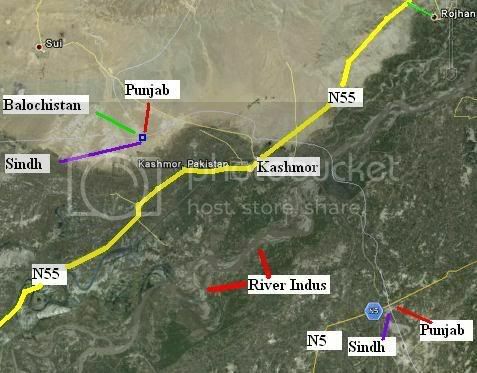 The map above shows the 60 km long alignment of highway N55 from Shikarpur to Kandhkot and passing through Ghouspur. Also visible is the circuitous river Indus just south of Ghouspur. Kandhkot is famous for being one of the largest ‘anaaj’ (grain) market in Pakistan. With a population of 66727 (1998 census), Kandhkot is the largest town in Sindh north of Shikarpur. A year round running tributary of river Indus flows very close to the town of Kandhkot and is the major attraction here. Kandhkot has a small air strip too. Kandhkot is also connected to the city of Jacobabad (on highway N65) via Mirpur and Thal and also to another town called Humayun (on highway N65). Kashmor is probably one of the most known city in Northern Sindh. It is also the largest city in the vicinty of tri-province area i.e. the boundary of Sindh, Balochistan and Punjab provinces. Just like there is a common theme of ‘Karachi to Khyber…’ for any Pakistan wide campaign, Kashmore is also mentioned in any Sindh wide campaign with the slogan ‘Karachi to Kashmore…’. My intent of mentioning it here is that you may already be familiar with Kashmore in more ways than what catches the eye. Kashmore is also close to Sindh’s northern most barrage called the Guddu Barrage. Two of the four canals taken out of Guddu Barrage namely Pat Feeder and Desert feeder encircle the Kashmore city from north and south. Kashmore also has an air strip. According to 1998 census, the city population of Kashmore was 28104. 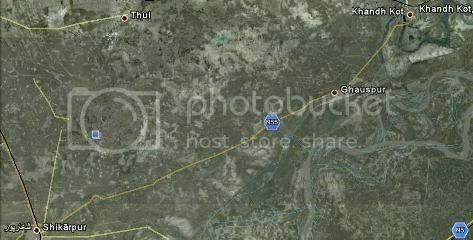 Look at the map below as it shows the location of Kashmore. Also note the interesting feature near Kashmore where three provincial boundaries of Pakistan meet. It is shown by a small blue rectangle in the map. Kashmore is a road junction to go to Balochistan town of Sui. It is also connected by a road over Guddu Barrage to highway N5 at a town called Umar kot (near Ubauro). The same road after crossing Guddu Barrage branches off to Punjab’s city of Sadiqabad and one can take this route to reach the famous Bhong Mosque. I am unable to research the exact kilometer marker on N55 for Sindh-Punjab border but looking at the map it appears to be within 5 km North-East of Kashmore. An exact marker information from our learned readership will be appreciated and I’ll make the correction here. From the Sindh-Punjab border on N55 to next town on the highway called Rojhan the landscape is pretty barren. It is obvious that Rojhan is the first (going north) or the last (going south) town in the Province of Punjab on N55. The village of Rojhan proper is few kilometers south-east of N55 from the kilometer marker 537 but there are few hutments and shop on the highway too. A small road called ‘Rojhan Road’ intersects N55 and goes to the village of Rojhan. Rojhan road on its way to Rojhan village also intersects the Jacobabad-Kot Adu Railway section. Rojhan village has its own railway station on this railway section. North of Rojhan, N55 and the railway line run parallel to each other for the next 70 kilometers. The highway passes two small towns called Kot Bahadur and Kotla Nasir at following kilometer markers before reaching Rajanpur. We’ll only mention the kilometers markers of these two towns below and meet you for some detailed tour of Rajanpur few lines down. 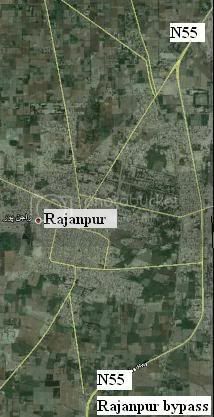 With a population of 42986 (1998 census), Rajanpur is one of the larger cities in South-Western Punjab. It is kind of sandwiched in a narrow strip of land between River Indus and Sulaiman range hills. The 70 km distance between Rojhan and Rajanpur is where Sulaiman Range comes closest to River Indus and in this narrow strip also run highway N55 as well as the railway track. Rajanpur’s distance from the banks of River Indus is approximately 15 km. A little bit history of the town goes like this the town of Rajanpur was founded by one Makhdoom Sheikh Rajan Shah in the years 1731 to 1733. This makes Rajanpur very historic city. Rajanpur gained population and prominence in 1862 when a closeby large and prosperous town called Mithankot got completely destroyed in the floods. People and Government offices from Mithankot then moved to Rajanpur. In 1873 Rajanpur became a municiplaity and in 1982 it was made a district by carving it out of Dera Ghazi Khan district. Rajanpur also has an airstrip. 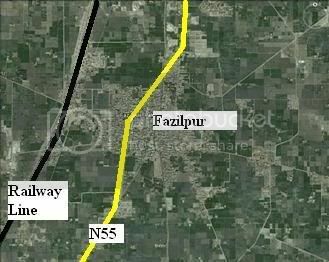 Just north-east Rajanpur the railway track crosses N55 and runs parallel to the highway at its north towards Fazilpur. Fazilpur is a small town on N55 with a population of 23929 (1998 census). Fazilpur is connected by Railways too. 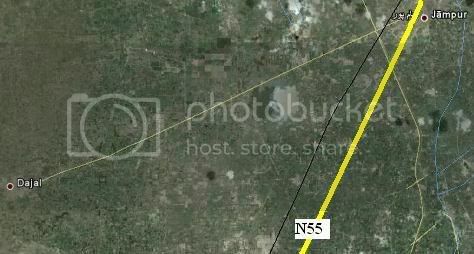 Railway line and N55 pretty much run parallel in the city as can be seen from the map to the right. A small road from Mohammadpur Diwan starts from N55 and goes towards the village of Dajal. From Dajal another small road goes to famous Harand Fort which we will describe in detail coupe of paragraphs below. Mohammadpur Diwan itself is a very small town but it an important marker on N55 for road junction towards Harand Fort. Jampur with a population of 51026 (1998 census) is the largest city on N55 between Kandhkot and Dera Ghazi Khan. It is said that Alexander the Great passed through this area on his quest to conquer the world. Antiques found in this area point to Alexander’s visit. According to local legend Alexander got inspired by the beauty of a local queen named Rukhsana and married her in a nearby Harand Fort. This stoty needs to be verified but it is quite a famous legend in this area. It is also said that Lever brother’s famous soad brand called ‘Rexona’ was named after the local queen Rukhsana of this area. The old city of Jampur was built on a raised surface aproximately 15 feet higher than surrounding areas. This was done to save it from regular flooding in Indus which years ago used to flow quite close to the city. The old city is also enclosed by a circular road which used to have 10 gates. These gates in olden days used to be toll collecting points for people bringing in their trade goods to the city. Jampur’s main bazaar (market) is called ‘saddar bazaar’. 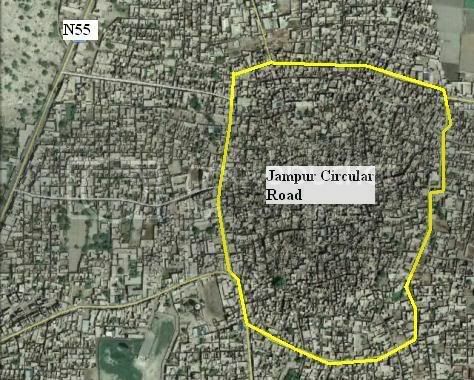 The circular road of Jampur can be seen in the map above. Jampur is also a junction point for a randezvous to historic Harand Fort. A road on N55 from Jamur branches off to a village called Dajal and another road from Dajal goes towards Sulaiman Range hills and to Harand Fort. Back in December 2006, at ATP we carried a detailed post on Harand Fort written by none other than our resident writer S.A.J Shirazi. Kot Chutta is a small town on N55. A road from here branches off to the town of Mamuri which then connects to Dera Ghazi Khan Airport. Another road from Kot Chutta connects to a small village of ‘Choti’ and then goes southwards to reah Harand Fort. With a population of 188149 (1998 census), Dera Ghazi Khan is the largest city in this stretch of N55 and a very important 4-way highway junction. This is the point where Jamshoro-Peshawar (north-south) N55 highway crosses with 439 km long Multan-Qila Saifullah (east-west) N70 highway. 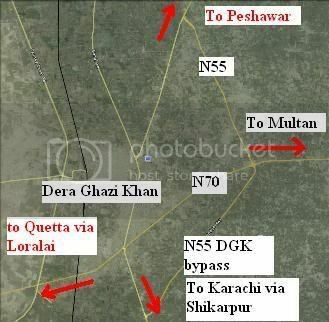 Hence Dera Ghazi Khan is the place from where you can literally take a highway to all 4 provinces of Pakistan – N55 South to Sindh, N55 North to NWFP, N70 West to Balochistan and N70 East to further inland in Punjab and to connect to main Karachi-Peshawar N5 arterial highway. The present day Dera Ghazi Khan town is a relatively new town. The previous Dera Ghazi Khan used to be on the banks of River Indus and got destroyed by severe floods in Indus in the year 1911. Present day city is built 15 kilometers inland from the river. Back in September 2009, ATP carried an informative post on Dera Ghazi Khan by S.A.J. Shirazi. I want to provide a link here to the post and our readers can get loads of information about the city here.. This completes our today’s journey on N55. I’ll try to get us to Peshawar in next two episodes of this series which is still 548 kilometers away from Dera Ghazi Khan. 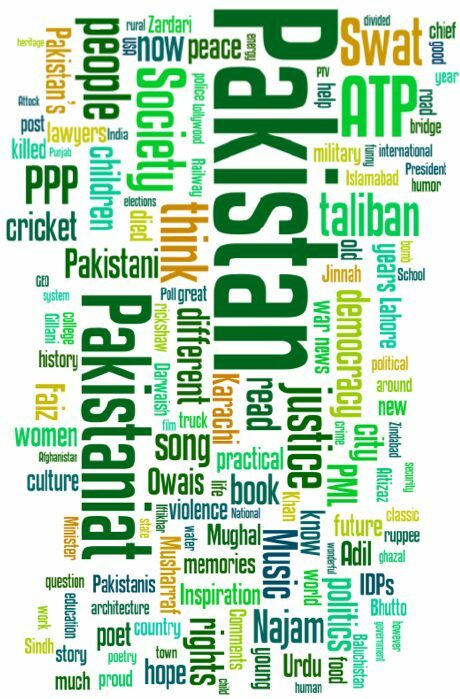 Look for the part III to appear soon at pakistaniat.com. 15. GPS Automotive Navigation in Pakistan. Government of Punjab has chronically failed in protecting the rights of people of Punjab. Which is evident from the fact that it has not made any efforts for the construction of Kalabagh Dam while Govt of Sind is very proactive even in wasting the water of river Indus in Arabian sea.If Punjab govt can not protect the rights of people living alongside river Indus,it will BE better to separate out those areas from Punjab,so that those people can protect their rights themselves. From NFC award it is evident that Punjab Govt has sacrificed the rights of people just for pleasing those who always hate punjab. Moreover Punjab Govt has not raised any concern about the suffering of people of Punjab in Baluchistan,Karachi and Sind. Thar coal project will have adverse effects on each and every living organism,atmosphere,enviroment in Punjab but Punjab Govt foolish leaders has not shown any concern about that project. Due to incompetent Punjab Government , situation has so much deteriorated that other provinces which are very vocal about Provincial autonomy are interfering in the affairs of Punjab by violating provincial autonomy of Punjab , for example Sindh Province Government and Assembly has started to give suggestions to Punjab that which Canal should be kept opened or closed, which Dam (hydrel project ) should be constructed or not, and which land of Punjab should be cultivated or not, while Punjab Government is completely silent about such interference, while Sindh Government is busy in wasting River Indus water in Arabian sea which is a sin and crime against humanity but Punjab government is making no objection about such wastage. You are right. this is a virtual trip but I’ve made sure whatever information is presented here is authentic and researched so that people traveling here can use it. Hello Owais – thanks for the reply. I think I must have misunderstood the part “We started our journey on N55 Indus Highway from its zero …”. I was thinking about you doing video blogging as you traveled through your journey in Pakistan, but I think this is a virtual trip, correct, i.e. you are not physically traveling though Pakistan. To someone from US: I tried to look for N55 photos on flickr etc but didn’t find any. I don’t have any personal photos either as I have only travelled portions of this highway and that too atleast 20-25 years ago. Ofcourse I am always looking for photos – if I find any I’ll share the link. Salam Owais – would there be some videos or pictures that you will be posting?